50 control stations spread over 14,000 productive hectares. Engineers advising the farmers throughout the year. Rigorous control of treatments and fertilizers. 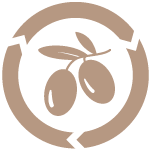 Each delivery of olives is classified on arrival so that different quality olives are never processed on the same line. Mechanized and randomised sampling of each batch at the laboratory. 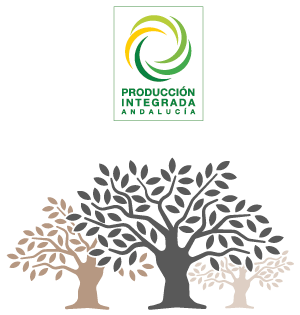 2 patios, with 5 lines per patio for independent processing of olives of different qualities. All of the surfaces in contact with the fruit are treated with special paint for food products. Trémies indépendantes avec moulins automatisés à l’air libre pour dissiper la chaleur. High quality transportation belts suitable for food products. Cold extraction and rigorous automatic temperature control. Separate processing lines according to quality. Continuous recording of temperatures and all process variables. 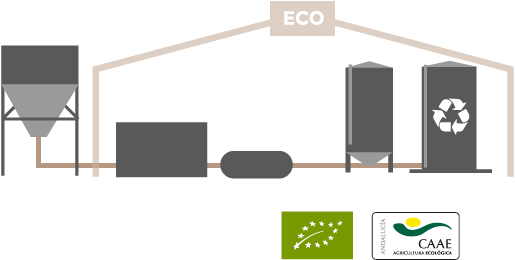 Sustainability: All of the heat and hot water requirements are covered by a boiler burning the olive oil waste that is obtained as a by-products. All of the by-products are either treated or sold on (leaves, waste olive oil and water are sold on to the irrigation community). Totally separate certified line for organic oils: Hopper - Cold extraction - Rinses - Deposits. A professional tasting panel assigns a quality level and the destination in the cellar. The traceability system makes it possible to check if there are any deviations from what was envisaged by the patio manager and the analysis of samples in the laboratory. 50 ton rinses. Before being sent to cellar, the newly extracted oils are tasted so that they can be classified. The whole of the cellar is covered and protected from solar radiation and the temperature is automatically regulated and controlled. The extra virgin olive oil are stored and filtered to improve its stability and conservation. Continuous improvement, subject to the most stringent national and international controls. More than 100 finely polished stainless steel tanks with capacities of 50 and 100 tons hold the olive oil in Conde de Benalúa 's cellars. Rigorous control before loading and sealing of the transport vehicles after loading. To ensure its quality, before packaging all of the products are analysed in expert laboratories certified by ENAC. At the end of the season the facilities are thoroughly cleaned and all of the machinery is dismantled, cleaned and kept safe until the next season. 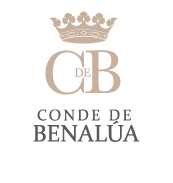 Conde de Benalúa's internal laboratory processes blind samples of all of the batches in 24 hours. Yields, acidity and peroxides are obtained. After the oil has been analysed, it goes on to the tasting panel. The tasting panel classifies each anonymous sample. extra virgin olive oil, virgin olive oil or Lampante virgin olive oil. The batch is characterized by its tasting and analysis. The Quality and Production Departments monitor and control all of the processes, traffic counts and workloads, etc. in real time. Cutting edge technology in order to always offer the best possible service.